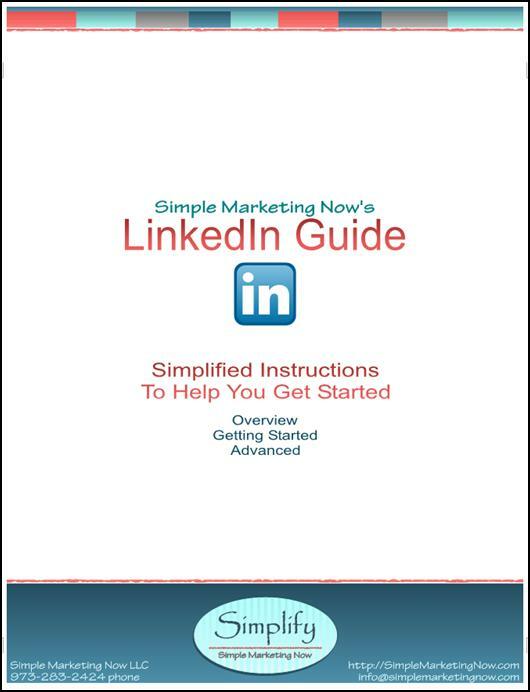 Download Simple Marketing Now's LinkedIn Guide! Are you on LinkedIn? Have you completed your profile 100%? Have you strategically placed keywords to increase the chances that your profile will appear in LinkedIn searches? Simple Marketing Now's LinkedIn Guide will tell you how, and more! Prioritize for you what to do first on LinkedIn. Describe LinkedIn's advanced features - including Groups and Answers - and how to use them. Provide you with examples and ideas for using LinkedIn for business. Simply fill out the form on the right to download a guide that will simplify for you how best to make use of LinkedIn for you and your business.